We offer comprehensive cosmetic dentistry with a gentle, personal touch. We enjoy building relationships with our patients as we guide them through their dental care or dental surgery experience. We offer them a safe haven to get the best possible care for their gums, teeth and overall oral health. We know that visiting the dentist can sometimes make people nervous. 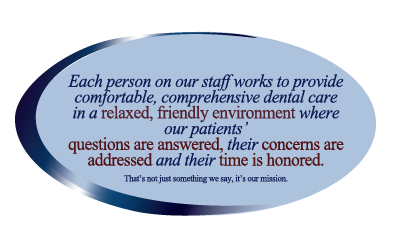 Our family atmosphere, gentle touch and conscious sedation services are intended to help our patients have a positive, comfortable experience when visiting our office for dental care. All of us - from Dr. Matthews to our hygienists, dental assistants, and front office personnel - have a genuine concern for your dental health and the overall quality of dental services you receive when visiting our office! Whether you’re coming in for oral surgery, cosmetic veneers, general dental care, or any of our other numerous dental services, our goal is to ensure that you have a positive experience. We want to WELCOME You to Our FAMILY!